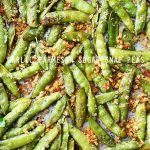 Garlic Parmesan Sugar Snap Peas – Healthy, delicious and quick to make roasted sugar snap peas tossed in a crunchy and flavorful parmesan cheese mixture. Hi ya, friends! How are you? Still dealing with food overload from Sunday? I sure am. And I’m still dreaming about a baking dish filled with cheesy creamy cauliflower that was sitting in front of me the entire time… I went for “seconds”. 6 times… still hoping that the hosts didn’t notice. After that food coma the other day, all I want to focus on is green veggies and salads. With a side of parmesan cheese… the green container kind. 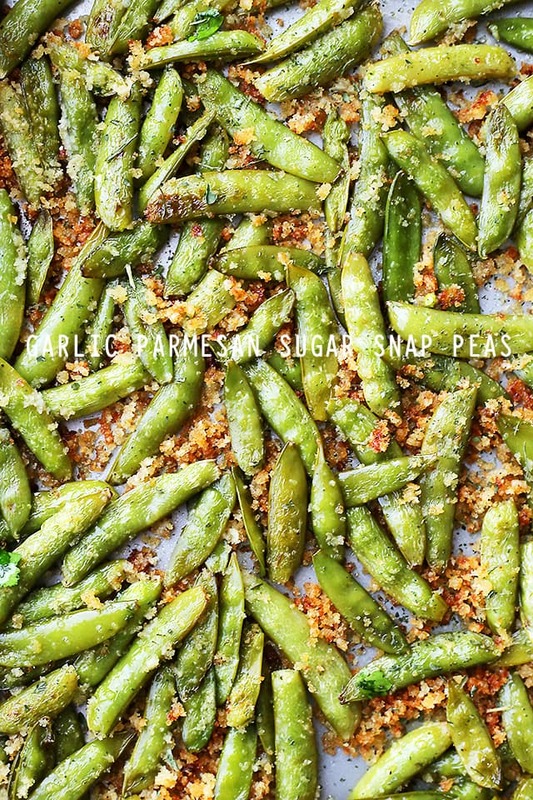 Important question: Do you love sugar snap peas? NO?! This recipe should change your mind, as long as you’re willing. As luck would have it, I happen to love them, but only if prepared with some Roasted Garlic Olive Oil from STAR, a sprinkle of parmesan cheese, and some panko crumbs for that lovely crunch. We all know that vegetables are great for us and that we need to eat more, but many vegetables pack a lot less flavor and it’s why people tend to ignore them. BUT, but, but we have a solution. 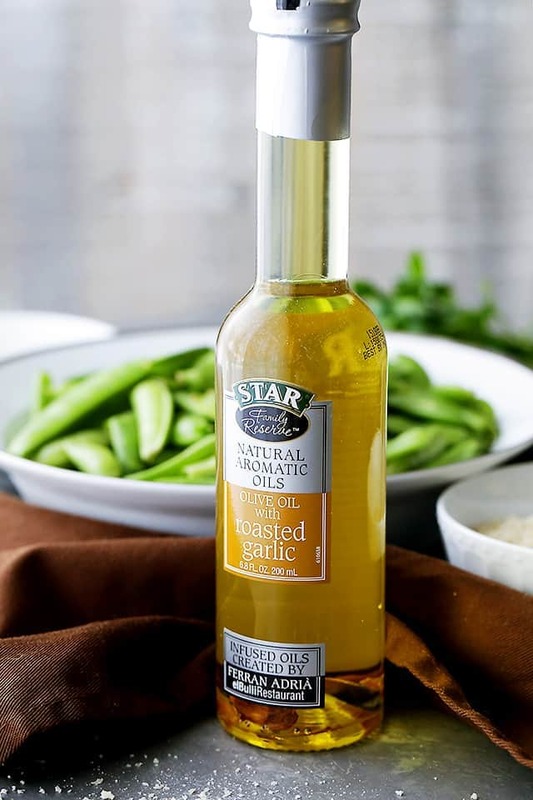 The Roasted Garlic Olive Oil pumps up the flavor beyond your imagination and you will find yourself having a hard time sharing these sugar snap peas with your loved ones. You’ll see. Let’s talk about how all this goes down. Grab your veg, rinse it, dry it. Prepare a mixture of panko crumbs and grated parm cheese. 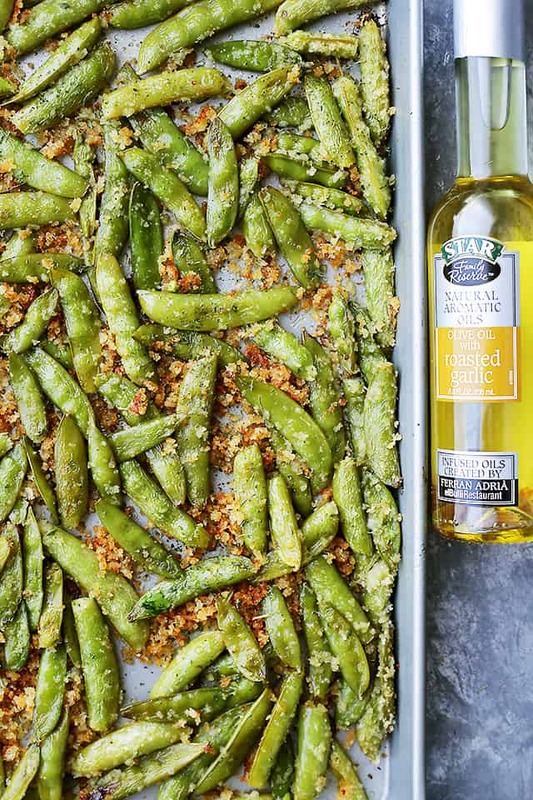 Reach for your infused olive oil and toss it with the sugar snap peas. Then, toss that with your parmesan mixture. Arrange it all on a baking sheet; roast for about 15-ish, 20 minutes and you’re done! Eat ’em up straight from the tray like I do, or skip the caveman age and serve them in a plate for everyone to share. 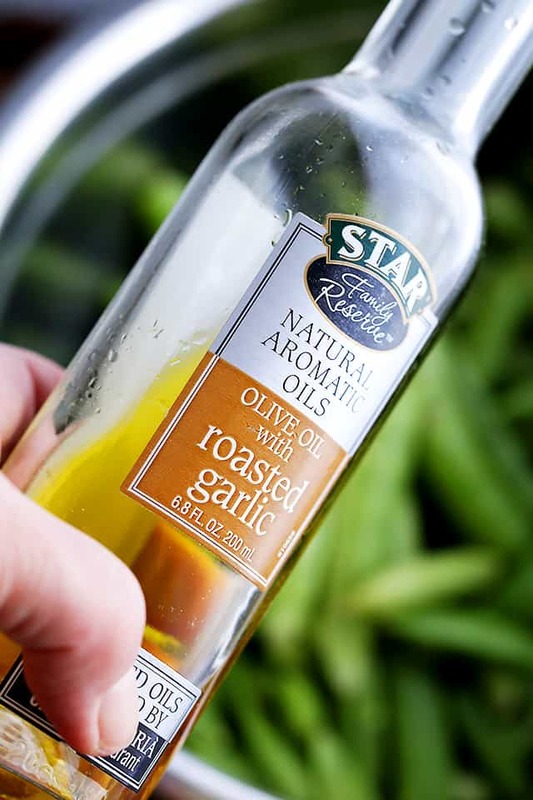 STAR Olive Oil with Roasted Garlic is available at select Walmart, Raley’s and Save Mart stores and ONLINE. 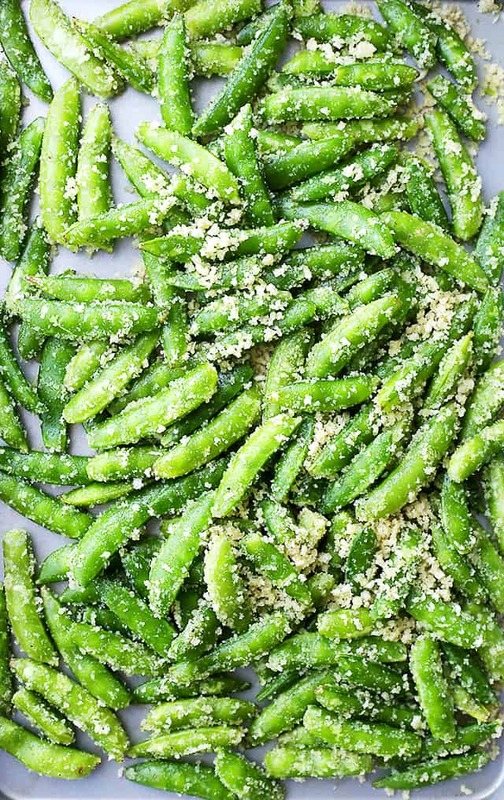 Garlic Parmesan Sugar Snap Peas - Healthy, delicious and quick to make roasted sugar snap peas tossed in a crunchy and flavorful parmesan cheese mixture. If you do not have "garlic olive oil", use 2 tablespoons minced garlic for the peas mixed with regular olive oil. So simple! Anything with garlic and parmesan is a winner in my book! Now that we’re back on the healthy eating train, these snap peas are just what I need! (I may even be tempted by 2nds or 3rds.. ;)) Happy New Year! These look great thanks for sharing! This is exactly the snack I want!!! Oh man, I already am a total snack-hoarder when it comes to sugar snap peas… but this version is going to take it to a whole new level! Looks phenomenal!! I’m always looking for good snacks to have on hand, and I have a feeling my daughter and I could eat an entire tray of these snap peas! YUM! I love sugar snap peas. Why have I never thought of roasting them?? Roasted garlic olive oil!!! YES!!!! These little snap peas are going to make a perfect side dish for dinner! Hi Bill! Sure! First you want to mince some garlic, 3 to 5 cloves, then in a small saucepan over medium-low heat, cook the garlic in olive oil for about 5 minutes, stirring frequently, until the mixture is lightly bubbling. Remove from heat, and let the oil cool completely before using. Make sure to watch it closely so that the garlic doesn’t burn. I hope this helps. Thank you!